Are you looking for the best way to share huge (GB) files online? Then you are at the right place for your query. Whether you want to send huge photo albums, heavy document files or any other kind of data, there are numerous options available to share files quickly, conveniently and safely. In fact, there is a whole market for cloud storage services for home and professional users, each with pros and cons that deserve to be explored. Check out the top ways to share heavy (GB) files online for free of cost. Google Drive can boast of having done for cloud storage services just as Gmail did with email, putting the market upside down with a comprehensive, practical and free solution. The truth is that Google Drive works better as a hard drive in the cloud than as a file-sharing tool, but it has a number of advantages that make its recommendation something inescapable. Not only does it not cost a single penny (although there are also payment options), but its 15 GB are quite generous and anyone with a Google account can take advantage of it. The file sharing system using Google Drive is relatively simple. Once uploaded the necessary documents and folders, just right click to send a link to anyone using an email address. It highlights its integration with Google Docs and, of course, is available on mobile devices through specific applications for Android and iOS. OneDrive is the alternative to Google Drive proposed by Microsoft. Because Google’s service is more cloud-oriented than file-based, it incorporates a number of additional features that make it a more practical option for some users. One of the advantages of OneDrive is that any user with an Outlook or Hotmail address already has an open account, so there is no need to do anything else. In addition to integrating almost invisibly with Windows 10 to free up space by automatically uploading our files from the hard drive, OneDrive is fully integrated with Office to allow any of our contacts to edit folders and documents directly from the Internet. It also has applications for Android, iOS and Windows 10 for mobile phones. OneDrive has some interesting options for sending documents. While its 5 GB is less than the storage space offered by Google, the Microsoft service allows you to set folders and shared links with expiration dates so that the data sent will only be available during the period of time determined by its owner. Select file, type email, send the file. Isn’t it easy?. It does not take much time to understand why WeTransfer has become one of the most popular options when it comes to sharing heavy files over the Internet. Sharing GB of information with our contacts is almost a matter of point-and-shoot. The advantages offered by WeTransfer compared to other services are obvious. The first one is that you do not need to register to send information, so it can be used instantly and without the need to remember passwords. Up to 2 GB of data can be sent in almost two clicks, but there is also a Plus option for professional users that increases the space limit to 20 GB, offering options like 100 GB of storage. With the free version of WeTransfer files sent by WeTransfer are automatically deleted after a short period of time, so its use is more suitable for sporadic transfers and users who do not need a permanent hard disk in the cloud. As simple as cash, WeTransfer is one of the most useful services of all listed, especially if you are only going to give it an occasional use. Filemail is a less popular option than the previous ones, but it brings a number of advantages. From the outset, the 30 GB offered in your free option is one of the most generous offers of all we can find, but it also offers multiple download possibilities, which go beyond the typical email link. Designed for a more professional use, Filemail offers features such as automatic deletion of files as well as downloads via BitTorrent and even FTP, making this an incredibly versatile option. Whether used at home or in the office, Filemail offers far greater flexibility than other services, even in its free mode. Filemail can be used via the web, but also through specific applications for Windows, Mac, Linux, Unix, Android and iOS in their paid versions. If this were not enough, Pro and Business users can access extra interesting services such as the possibility of integrating a file uploader on your website and a plugin to send large files directly from Outlook. If flexibility is a priority factor and we plan to send large documents with some regularity, Filemail is a very important option to keep in mind. Send Anywhere is not a file-sharing tool like the rest. Although it is fast and simple, its real strength lies in the built-in protection measures to make your transfers safe. This feature has made Send Anywhere one of the favourite options among large companies and users concerned about their privacy. The techniques used by Send Anywhere to protect files sent through its platform are multiple. To begin the files are sent using a P2P service to prevent their theft by hackers. Moreover, information is encrypted and documents can only be downloaded after entering a numeric key or a unique QR code, thus verifying the identity of the receiver. To increase the security level, Send Anywhere automatically deletes files after download. Only those sent through a link or from device to device are kept for 48 hours, in which case they are removed, even if they have not been downloaded. Send Anywhere is particularly handy for file sharing between devices with different operating systems and is available in both web and app versions for Windows, MacOS, Linux, Android and iOS. Its managers have also created an extension for Chrome that facilitates its use directly from the browser and a plugin to integrate it into Outlook. Sending data is restricted to 2 GB via the web, but is unlimited using the PC application. Awesome isn’t it? This is all about the 5 best ways to transfer GBs of files online with high-end security online. I hope this article will help you to send huge files online without any errors. If you have tried any of these apps, share your experiences with our readers. If you are going to use any of these apps and if you face any difficulties while using it, let us know through the comment section below. We will solve all your queries as soon as possible. Which way is the best one to share Huge data files online? Discover the best apps to earn money through your Android or iOS mobile phone. You probably do not become a millionaire through your smartphone, but it can help you save and make ends meet. The best trick to boost your savings is to have multiple sources of income (in addition to cutting back on unnecessary expenses). And this can be done through the vastly used device called a smartphone. In this article, I am going to share a few income sources where you can earn some decent money. There are several apps with which you can earn money. Here are few apps which help you to earn from your smartphone itself. The apps are as follows. Scroll down to see the list. This app is available for both Android and iOS which pays you for surveys. They tell you exactly how long it will take to complete the survey and how much money you will get for it. When you reach the 30 dollars you can charge. So far Inbox Dollar has paid more than 35 million dollars to its members since 2006. The reviews and ratings are given as per the Google Play Store. With this app, you can kill two birds with one stone. That is it helps you to take care of your line and also to save. You must meet your challenges, otherwise, you will lose money. The money that some users lose can be won by other members if they fulfil their purpose. That is, every time you achieve a goal you will receive about $ 2. It is available on both Android and iOS platforms. This app pays you money for displaying ads on your wallpaper. How does it work? In your lockdown fund, you will see product promotions, articles or surveys, and you will earn money by sliding the advertisement to the left and accessing the link. Fronto is only available for Android. With this app, you can earn money simply by displaying an ad on your lock screen, without needing to access the link. They pay between 5 and 15 dollars a month and at the end every day they will notify you with the money that you have obtained. At present SlideJoy is available for only Android. This app available is for both Android and iOS devices. It also pays you to see ads. You just have to invest your time in watching your trailers. These are not only related to apps, but there are also movie trailers and games. You’ll earn points for each ad you see, then you can redeem on PayPal or get them on an Amazon, Best Buy, or Starbucks gift card, among others. Note: The entire reviews and ratings are given as per the Google Play store. I suggest you try every app yourself and find out which one suits you the best. That is it!. These are the 5 best apps to earn money online through our Android and iOS smartphone. Now, it became very easy to earn extra money on our mobile phone. Whether it is an Android or an iOS device, everyone can add extra income to their pocket. Awesome isn’t it? If you have any queries regarding any of the apps in the above list, let us know in the below comment section. We will get back to you to solve all your queries as soon as possible. If you know any other best app which suits to our topic, write them in the below comments or you can mail us at [email protected] We will verify it ourselves and will include in this article in the next update. If you are already earning through your mobile, it would be helpful if you share your tips and experiences with our readers and freshers who are going to start this way. Which app or method do you use to earn money online through mobile? When there is a new software update available for the iPhone or iPad, it will be automatically downloaded if the device has a Wi-Fi connection. This is great because it makes us forget to manually update the product, and as soon as the download is done, it will ask us to update the system. But if you have an iPhone or iPad that you do not want to update for whatever reason and the update has been downloaded, there is no reason to keep it, because it only takes up space. Let’s see how to remove that iOS update and save space on our iOS devices. If you are a handyman and you like the risk, you can always open your iPhone channel and change the NAND memory for a 512GB. For those of us who are not so skilled, there is a very simple way to recover valuable gigs by deleting the update. Not only will save a lot of space on your iPhone or iPad, but you will also stop seeing the notification that an update is available. Open Settings on iPhone or iPad. You will see a list of apps installed on the device, among all these apps, there will also be the software version that has been downloaded. Click on it and then press Delete. Once this is done, you will no longer see an “update available” in the system settings. On the other hand, keep in mind that updates take up a lot of MB, so you’ll save a lot of space. Can you avoid automatic updates and downloads of software? Unfortunately not, Apple does not allow you to nip in the bud with this issue, so you will always be downloaded the latest version available for the device. That is it! This way we will be able to remove the updates and save a lot of space on our iPhone and iPad devices. If you have any other queries regarding the memory full let us know in the comment box. We will get back to you as soon as possible to solve all your queries. If your iPhone or iPad memory storage is still full, follow this guide to free up storage space on your iPhone or iPad. Which iPhone with the memory capacity you are using now? During yesterday we showed you a simple process by which you can download and save YouTube videos directly from your iPhone or iPad. To do this, we use the Documents app, which allows us to manage the download from an integrated browser. Many readers have asked us if it is possible to do this in another way, effectively. And yes it is possible with Workflow, the Apple automation app. Download the Workflow app if you do not have it installed. Open this download link from Safari on your iPhone or iPad. Once the link is opened in the Workflow app, Press Get workflow. In any app, open the share menu and edit it by making sure that the Run workflow. With Workflow app, we can also manage our phots. Click Run Workflow and choose YouTube workflow. As you can verify, the process is very simple, we just have to press a few buttons once we have the video that we are interested in downloading. A workflow is a powerful tool, and this type of workflows prove it day by day. Remember that you can download the app for free from the App Store, at the time it was not a free app, but Apple bought it a few months ago and became it. That is it! This is how we can download YouTube videos to your iPhone or iPad with the help of Workflow app. I hope this article helps you to do the work in a simple way. If you have any queries regarding the above method, let us know in the comment section below. We will get back to you to solve all your queries as soon as possible. If you know any other method to download YT videos to our iOS devices write them to us through our Contact Us page or in the comments below. Which method do you use to download YouTube videos to any iOS devices? With iOS 12, Apple is taking a number of big steps to protect your privacy better than ever before. CEO Tim Cook emphasizes in an interview why Apple is committed to this. Apple has been known for years as a company that considers users’ privacy to be of paramount importance. With iOS 12 they show that this is not forgotten. “Privacy is a fundamental human right”, CEO Tim Cook explains in an interview with CNN shortly after the keynote. “Users can be confident that Apple is on their side,” Cook continues. He thinks that many people are not aware of the ways in which their data are used and that this is an important role for tech companies. With iOS 12, Apple adds the word to the word with the following new features and improvements. One of the ways in which social networks like Facebook secretly monitor your internet behaviour is via the Like button that can be found on numerous websites. For that button to work you have to be logged in, which means that every site with such a button can be used to follow your internet behaviour. In this case, it does not matter whether you click on the button or not, as soon as it is where you can be followed. Apple takes action with iOS 12 and MacOS Mojave against this sneaky way to keep an eye on users. From this update, every time you try to follow Facebook, you get a notification that asks for permission. If you refuse this, the button will be blocked. The result is that Facebook and Google get a lot harder to serve your ads based on your interests. In addition to blocking such buttons, more adjustments have been made to make your internet behaviour more anonymous, without you having to do anything yourself. So no more information is shared about the plugins you use, which font you have chosen and information about other settings is also withheld. “That way your Mac looks like all other Macs, which makes it harder to follow you”, explains Apples Craig Federighi. Convenience serves man, and the easier it becomes to use a password manager and two-step verification, the more people will do it. 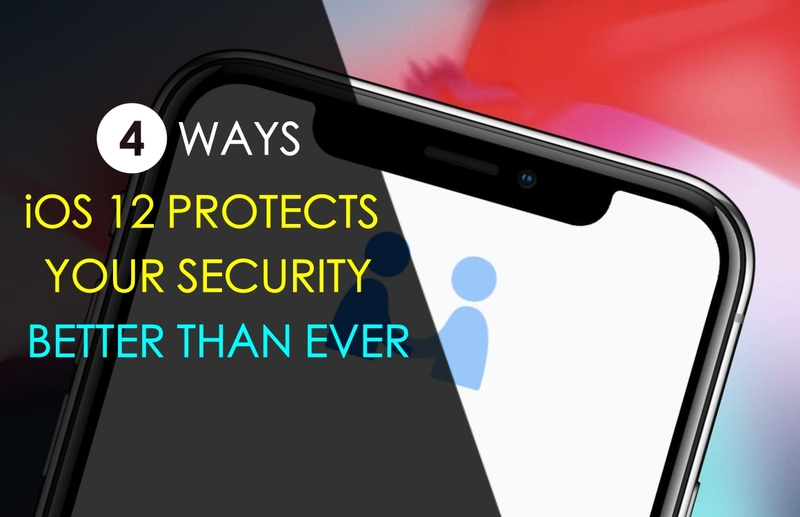 With iOS 12, Apple makes it easier to use both security features. For example, SMS codes for two-step verification are now automatically filled in so that you do not have to switch between apps quickly. In addition, password managers such as LastPass and 1Password have the option to make automatic suggestions if you log in somewhere. That makes it easier for you not to switch between your password manager and your browser. Recently it appeared that an iPhone can be cracked with special devices. These boxes are connected to the Lightning port and then try to guess your password just as often until they find the right combination. With iOS 12, Apple puts a stop to these machines with a simple setting: from now on, no more data can be sent or received with a Lightning cable if the iPhone has not been unlocked for an hour or more. In daily use, you probably will not notice this, but it prevents that malicious people can take off your data. Want to know more about WWDC 2018 and everything else in iOS 12? Then check out our complete new features of iOS 12 here. If you have any other queries regarding the iOS 12 let us know them in the below comment box and we will get back to you soon to solve all your questions. Which iPhone or iPad device you are using now?